Relax and enjoy these fun bath bombs. Soak in the light oils and paper yourself after a stressful day. Run a tub of nice warm, soothing water and hop in. Drop the bath bomb into the tub. Relax, breathe in and enjoy the fizzy sensation and aroma. 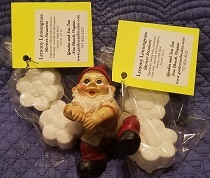 Shower steamers are great for those that don't have time for a soak but still want to enjoy a fresh, uplifting scent. 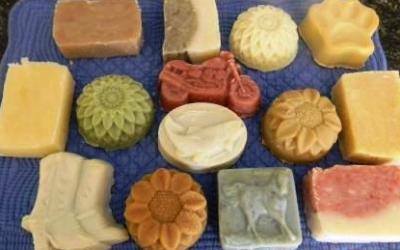 They are paraben-free, phthalate-free and sodium lauryl sulfate-free (No SLS). We use only natural colorants. This means they are derived from mineral, plant or animal as defined by the FDA. 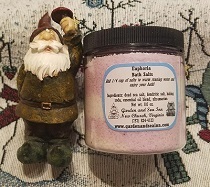 Treat, detoxify and cleanse your body with our Euphoria Spa Bath Salt made from the Dead Sea rich in minerals. Inhale this great combination of aromatic jasmine, wild rose and warm sandalwood. Ingredients: dead sea salt, dendritic salt, baking soda, essential oil blend, ultramarine. 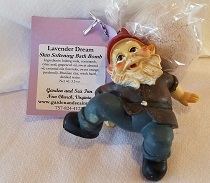 Lavender Dream Bath Bomb - Wind down with this relaxing blend of lavender, sweet orange and patchouli. Submerge yourself in nourishing oils and a bath bomb with a beautiful natural color. Ingredients: baking soda, cornstarch, citric acid, grapeseed oil, sweet almond oil, essential oils (lavender, sweet orange, patchouli), Brazilian clay, witch hazel, distilled water. Lavender Lemongrass Bath Bomb - A refreshing blend of lavender and lemongrass with complimentary properties. Lavender is both calming and soothing to the skin. Lemongrass is one of the most versatile and health-promoting essential oils. It has anti-inflammatory benefits and is uplifting. Ingredients: baking soda, cornstarch, citric acid, grapeseed oil, sweet almond oil, lavender and lemongrass essential oils, French clay, witch hazel, distilled water. Lemony Lemongrass Shower Steamer - Shower Steamers are great for those that don't have time for a soak but still want to enjoy the fresh uplifting scent of lemongrass. Just place the steamer on shower floor away from direct spray of hot water. Breathe in and enjoy! Made with all-natural essential oils. Ingredients: baking soda, cornstarch, citric acid, lemon and lemongrass essential oils, witch hazel. Rain Forest Bath Bomb - A clean, fresh woodsy blend both men and women alike will enjoy. Ingredients: baking soda, cornstarch, citric acid, grapeseed oil, sweet almond oil, essential oil blend, French clay, witch hazel, distilled water. Sinus Bath Bomb - Inhale this aromatic blend of camphor, eucalyptus, menthol and rosemary in a warm bath, Your skin will love the light oils in this fizzy. Ingredients: baking soda, cornstarch, citric acid, grapeseed oil, sweet almond oil, sinus blend essential oil, kaolin clay, witch hazel, distilled water. Stress Buster Bath Bomb - Soak away your stress with this delicious blend of lavender, chamomile, neroli and patchouli in a warm bath. Your skin will love the light oils in this fizzy. Ingredients: baking soda, cornstarch, citric acid, grapeseed oil, sweet almond oil, essential oils (lavender, chamomile neroli, and patchouli), French clay, witch hazel, distilled water. Tension Bath Bomb - Feeling frazzled? Lock the door and breathe in this soothing blend of sweet orange, bergamot, and lavender in a nice warm bath. Ingredients: baking soda, cornstarch, citric acid, grapeseed oil, sweet almond oil, essential oils (sweet orange, bergamot, lavender), French clay, witch hazel, distilled water.